Niobium was discovered by English chemist Charles Hatchett in 1801, Niobium is a soft, grey, ductile element classified amongst the transition elements of periodic table. It is used in making high-grade structural steel. Niobium was discovered in 1801 by Charles Hatchett. Initially, it was named Columbium (with symbol Cb) after Columbia; a state of United States. Later, due to confusion, it was considered another element, known as tantalum, and in 1846, German Chemist Heinrich Rose proposed that it was indeed a novel element and named it Niobium. For almost a century Europe and USA used their own name for this element. Later in 1949 at the 15th Conference of the Union of Chemistry, the name Niobium was chosen as the 41st element of the periodic table . 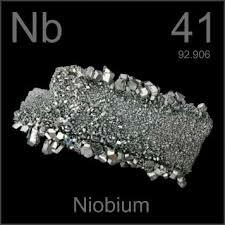 The symbol for Niobium is Nb. Niobium is not a very rare element. Niobium can be found in nature only in compound state. Mineral columbite is the main source of this element. It is ranked as the 33rd most common element in Earth’s crust. It is present in abundance at the core or center of the earth. Large deposits of Niobium are found in Brazil and Canada and are the largest producers of niobium mineral concentrates . It is also found in Australia, Russia and Nigeria. Niobium is a soft, lustrous, ductile transition metal. It is greyish in color and is changed to blue when exposed to air and oxygen. It has a cubic crystalline structure. It becomes a superconductor at very low temperatures . Niobium can produce strong magnetic field. It has a high melting point, 2469°C. Despite being a refractory metal, it has a considerably lower density (i.e. 8.57 g/cm3). Niobium becomes resistant to further corrosion, when a layer of oxide is formed on its surface. Atomic number of niobium is 41. Niobium is a reactive metal. It readily reacts with carbon, sulfur, nitrogen, and oxygen. It does not react with acids, at room temperature. However, niobium reacts with hot concentrated acids and alkalis. Niobium is attacked by oxidizing agents. And it readily reacts with halogens. Niobium is used to increase the refractive index of glass. This allows optical corrective glasses to be made with lighter and thinner lenses. Niobium is used in making commemorative coins. Niobium is used to make special stainless alloys. About 90% of extracted niobium is used in making high grade structural steel . Niobium is used to make various super alloys. These alloys are used in making rockets and jet engines, oil rigs and gas turbines. Grinders and beams for buildings are also prepared consuming alloys made using niobium. These alloys show improved strength at low temperatures. Nozzle for Apollo Service module was also made using niobium alloy . Niobium carbide is used in the manufacturing of sharp cutting tools. Niobium is also used in manufacturing of surface acoustic wave devices, which are essential components of electronic components . Niobium is used to make superconducting magnets for MRI scanners, nuclear magnetic resonance and particle accelerators . Niobium is hypoallergenic and is used in making implant devices and prosthetics. Niobium is used for making wide array of shimmery color jewelry. Niobium is used in as a catalysts for making acrylic acid . Niobium in elemental form is non-toxic. People rarely are exposed to compounds containing niobium, but some are harmful and should be avoided. Niobium is considered as a potential fire hazard. Niobium dust is toxic and is irritant to skin and eyes. Apart from this, niobium alloys are tested to be physiologically inert and hence harmless. It does not react with human tissues which is why it is used in surgical implants . When inhaled, it is mainly retained in lungs and bones. Inhalation of nitride or pentoxide of niobium in concentration more than 40 mg/m3 of niobium can lead to severe damage to lungs. There are fourteen isotopes of niobium. Natural niobium has one stable isotope, niobium-93. This isotope is extremely light weight and is considered as the lightest nuclide and is susceptible to undergo spontaneous fission. The most stable radioactive isotope of niobium is niobium-92.
. Peiniger, M.; Piel, H. (1985). “A Superconducting Nb3Sn Coated Multicell Accelerating Cavity”. Nuclear Science. 32 (5): 3610–3612. doi:10.1109/TNS.1985.4334443.
. Hillenbrand, Hans-Georg; Gräf, Michael; Kalwa, Christoph (2 May 2001). “Development and Production of High Strength Pipeline Steels” (PDF). Niobium Science & Technology: Proceedings of the International Symposium Niobium 2001 (Orlando, Florida, USA).
. S. T. Scheirer, C. R. Cook, “Development of Columbium Alloy Combinations for Gas Turbine Blade Applications”, (Interim Technical Management Report No. 4, prepared under contract AF 33(615)-67-C-1688 by TRW Inc. August 31, 1968).
. Nowak, Izabela; Ziolek, Maria (1999). “Niobium Compounds: Preparation, Characterization, and Application in Heterogeneous Catalysis”. Chemical Reviews. 99 (12): 3603–3624. doi:10.1021/cr9800208.
. C. K. Gupta ,A. K. Suri, Extractive Metallurgy of Niobium, (CRC Press, Boca Raton, Florida, 33431, 1994), 3, 22.